Baby, it’s cold outside. And on some days, it takes me longer to get my three young kids dressed and ready for the cold than the amount of time we will actually be outside. But we must. Get. Out. Fresh air and energy burned are needed for my sanity and their moods. On the days that are too cold or too wet to be outside for long, I need indoor solutions to keep my kids active—activities that do not involve scaling the curtains or throwing things at each other. The TP Activity Spiro Bouncer is just the solution. 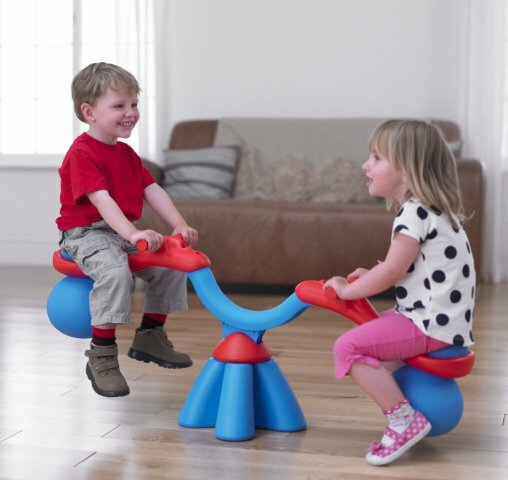 The Spiro Bouncer is an indoor teeter totter, though it’s made with sturdy and weather resistant materials that make it perfect for outdoor use too. This is not just any teeter totter, however. Spiro spins 360 degrees on a center axis and the rubber ball seats bounce as they hit the floor, adding a new level of fun and challenge to your child’s active play. Spiro Bouncer is designed for kids two to five years old and each seat supports 55 pounds. Yet, it’s only nine pounds; perfect to move from room to room or even a friend’s house for a playdate. I found reviews that verify that the assembly is really fast and easy. Reviews also mention you should take the manufacturer’s advice and add some sand to the base for a little more weight and stability. A sand funnel is included; a pump for the bouncy seats is included too. I’ll be honest. The last thing I want in my house in another bulky apparatus for my kids. However, I spent an hour one weekend hosing and washing off a small outdoor play structure so I could bring it inside. My kids, especially my 18-month-old boys, are just too busy and active to not give them something safe to climb and jump off of. The structure is in the basement and is a great alternative to me tearing my hair out. The TP Activity Spiro Bouncer is a great alternative too. And it’s smaller than the mini playground in my basement. The Spiro Bouncer will keep active kids busy and happy, and it will help develop and strengthen their gross motor skills and coordination. 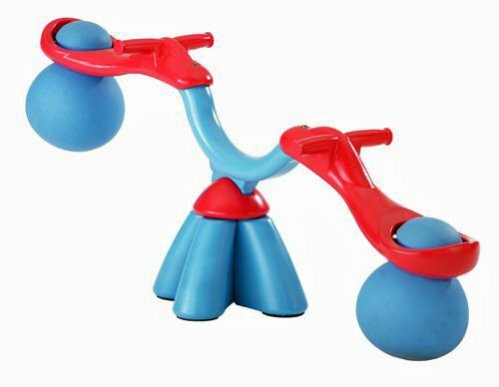 And since it takes two to teeter, your kids will need to work on their cooperation skills too. It can be hard to keep your kids active during the long winter months. The Spiro Bouncer is the indoor teeter totter that spins and bounces you and your kids to happiness. It might be cold outside, but Mama’s sane inside with a Spiro Bouncer. With Oil At $100, Is Pipeline Seating A Surprise?